Inch for inch, a switching layout built on a small bookshelf provides more action than perhaps any other form of model railroading. And not surprisingly, the grandaddy of all small, portable layouts was exactly this kind of layout, built in 1926 in England by A.R. Walkley. Revived in the 1980s and crafted as a switching game by Alan Wright in his Inglenook Sidings layout, this shunting concept is still going strong and providing lots of fun for modelers! The Walkley layout included the solid lines in this diagram. This micro version of the Walkley/Inglenook layout takes up only three square feet–9″ x 48″ (23×120 cm). To be a classical Wrightian Inglenook, Track 1 should hold five cars, and tracks 2 and 3 each hold three cars. The head shunt (yard lead) holds three cars plus a switching locomotive (you may need to extend the head shunt, as shown in dotted lines above). Operations on this simple layout can be amazingly complicated and interesting. For more details, see Adrian Wymann’s marvelous website on Shunting Puzzles. In a series of experiments, I’ve found that you can have fun shunting in a very small space by making the spurs hold as few as 3, 2 and 2 cars respectively. The yard lead should hold two cars and your loco. The basic operating idea in this “minimalist” version is this: randomly scatter five cars on the sidings, leaving Track 3 open. Then, from a bag or hat, draw three pieces of paper containing car names and numbers. Your task is to assemble a train on track 1 using those cars in the order drawn. You’ll be surprised at how quickly this simple-sounding task becomes snarled, requiring you to plan your moves carefully. If you expand to the full 5-3-3 Inglenook, the switching task can become exceedingly tricky, very quickly! You can readily add more features to expand this basic operating scheme…many ideas have been written up in the various model railroad magazines over the years. If you operate this switcher like a real railroad yard, you’ll want an arrival/departure track hidden behind the scenes, to represent the “rest of the world”. It can be added quite easily as Track 4. And you may find that a little more length on the switching lead (head shunt) would be useful…just add it as a removable feature on the left end. Scenery is up to you–I’ve seen shelves with scenery ranging from Maine seaports to sleepy Midlands country terminals, and from the Brooklyn Waterfront to the hardscrabble mining country of Colorado. There are more examples below. For simplicity, ease of construction, and sheer operating enjoyment per square inch, it’s hard to beat the Inglenook! 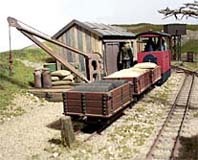 A superb example of an Înglenook is Steve Bennett’s tiny narrow-gauge switcher, Ash Valley Farm Supplies. 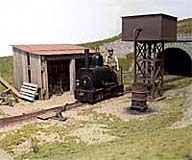 Built in 12″x36″ (30×90 cm) in O scale, 9mm gauge, the layout was designed` as an experiment in lightweight baseboard construction. Operation is classic Inglenook style. “The baseboard is 36″ by 12” and is constructed of 4mm thick foamcore board, braced with lightweight 15mm by 21mm softwood, producing a very light and strong base on which to construct the layout. The scenic contours are carved from expanded polystyrene foam with the rock faces being made of tissue paper dissolved in a diluted white glue. The ground cover is a mixture of crushed limestone ballast and proprietry ground foam from Woodland Scenics and Greenscenes. “All the structure are constructed of balsawood with detailing made from plastic strip and sheets. The trees are constructed of brass picture hanging wire soldered together and then coated in a plaster, white glue and acrylic paint mixture; these have never been finished so it is always winter in the Ash Valley. “The track work is from the Peco 009 range and consists of two right hand points and two yards of flexitrack. This has been kept very simple but it is still possible to lose many hours shunting wagons to and fro. All rolling stock is scratchbuilt from plasticard or assembled from my own range of kits and are fitted with magnetically operated couplers, giving automatic uncoupling at various points on the layout. Trevor Simpson sent me a delightful variation on the shelf-switcher, a 6″x36″ 2mm scale plan that he called Smallbury. I have butchered his elegant drawing a bit, adding a three-way switch as he suggested, to shorten the plan by 6 inches producing Smallbury Parva. In HO/OO scales, this design could be built in 10″x56″. 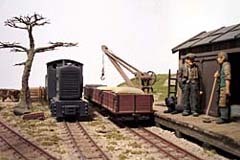 The goods yard is an Inglenook-like arrangement that Trevor has connected to a main line running from the passenger platform (at right, below an elevated station) to a cassette style fiddle yard. Passenger traffic can be served by a push-pull steam train with one or two coaches, or in more modern times by a DMU railcar or two. Many thanks to Trevor for sending in this nicely designed plan! In addition, of course, a randomly-generated switching/shunting list can be run to the industries scattered around the layout. They’re modeled, reduced to shallow “flats,” or simply painted on the backdrop. Some sort of train-carrying cassette or “fiddle track” will be needed offstage at the upper right. Track is designed using Geren’s own On30 templates for industrial trackage. The templates are available at the On30 Conspiracy in Yahoo! Groups. A Modern Coal Dock — Our First N Scale Micro! Normally I don’t include N-scale plans in this Gallery, because it’s too easy to make a good N layout in four square feet (the size limit for micros). But Jim Hofer has created a plan that adheres closely to the spirit of micro-layout designs, in a 4’x1′ space, in N Scale. So here is our first N layout plan (and I hope not our last!) — the Monongahela Coal Dock Co. He selected a specific prototype scene that epitomizes a particular railroad activity. In this case, Jim has chosen to model a water to rail coal transfer dock that includes features from three different prototype operations located on the Monongahela and Ohio Rivers where Pennsylvania meets Ohio. His time period is Right Now. He limited the design to one specific scene and used the space available to capture the prototype operation as well as to accommodate long, modern cars. He provided backstage “fiddling” room — perhaps a cassette — for preparing trains to appear onstage. And he arranged things so that the railroad operates just like the prototype, in a very small area! Those qualities are the essence of “Micro-thinking.” The loading facility is a double coal bin that discharges into both railcars and dump trucks. The bin is loaded by a crawler-type crane with a clamshell bucket — although a conveyor system would also be prototypical when used with the crawler crane. The barge is a modern type, 195’x35′ with a load capacity of 900 tons. Motive power for the line depends on the prototype you’re following. The Union Railroad’s dock in Duquesne, PA sees SW-1, SW-9, and SD-9s ; the Glassport, PA Transportation Center uses an SW-7 and an SW-9; and the Wheeling & Lake Erie currently uses a hi-nose GP-35 to work the docks at Yorkville, OH. The Coal Dock Lead can hold an SW along with four twin hoppers or three 100-ton hoppers, or an SD-9/GP-35 and two 100-ton hoppers. Train operations on the “Mon Dock” are mainly to move loads from the coal dock to the rail spur that disappears behind the tree line into the “fiddle track.” Empties are switched from the Empties Track to the coal dock as needed and replenished from backstage. Jim reckons an operator can easily be kept busy for 45 minutes in an operating session, drilling the various sidings. The center of attention is of course the coal transfer mechanism, which will be a challenge to your ingenuity as well as to your modeling skills. In this small micro layout area, Jim has managed to encapsulate the essence of contemporary coal handling along the rivers near Pittsburgh. Are Two Nooks Better Than One? Further down the valley, beside the lake, is the slightly larger village of Grosse Zweinuck. The station was obviously designed by the same engineer, although he allowed for a passenger station here as well as the goods depot. A sector plate, concealed within the large factory at the edge of town, conceals the “main line” that conects with the outside world. Scenically, the large factory should be treated to look as though it simply blocks our view of the mainline, rather than concealing it inside! Strategically placed trees and walls will help. The “Double Nook” arrangement takes up the lower half of this plan, and also provides a lakeside loading and unloading wharf track. In the space of two metric sheets of paper laid end to end, Emrys has concocted some major shunting action and , in the case of Grosse Zweinuck, a busy passenger activitiy as well. There are no longer any excuses for not building a layout on the grounds that there’s “no room”! Ian Holmes, from northern Minnesota, has developed an unusual approach to Inglenook switching problems, that also provides intriguing track patterns not unlike many prototypical industrial railways that “just grew.” Ian explains: “Links Mine has no pointwork (turnouts); I replaced it with a sector plate. I like the fact that not all the tracks are nice and parallel … very prototypical. You will be using small 4-wheeled locomotives and short, two-axle industrial rollling stock on this line. Limited Inglenook switching games will work fine, using the sector plate as a rather cramped lead track. And the patterns of general shunting will be just as confused and confusing as the real thing so often is or was! If you prefer On30, On18, HOn3 or HOn30 [that’s O16.5, O9 or OO9] they can easily be substituted for the 14mm gauge track shown. Layout Designer’s Note: Ian has pivoted the sector plate closer to the center than usual, in order to create wider separation between the radial tracks in his narrow space. This is a trick that works well in many tight micro-layout design situations.